A little after one o’clock in the afternoon on April 22 in Frankfurt, Germany’s Bockenheimer Warte, a Cirque du Soleil performer juggled to an overly choreographed routine to Bloodhound Gang’s “Bad Touch.” For each exaggerated “You and me baby ain’t nothin’ but mammals,” the crowd’s collective cringe turned from acknowledgement to avoidance. In the middle of the act, one man raised his sign, “Pi is all the irrationality I need,” an accurate metaphor for all events unfolding. 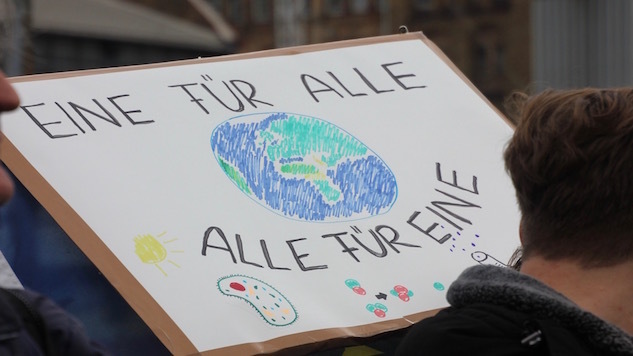 The “March for Science,” to Germans, was almost entirely about rationality, not scientific investment or “the many ways that science serves our communities and our world” or any of the other twenty-odd reasons listed on the official “March for Science” webpages. Since WWII, Germany has lumped together knowledge and democracy, for obvious reasons. The Nazis burnt books and people and called the news fake—Lügenpresse—until government propaganda became the normal news. Because of this democratic relationship with science, we decided to interview four German scientists and asked them to discuss the role of science in Germany, in a functioning democracy, and in relation to the United States. “Freedom is a value in itself. In science, freedom is furthermore functional: Research and teaching are, without science, inconceivable; communication and enlightenment are not possible. Without freedom, no science. Without science and education, there is no sustainable society. Dr. Baumgart, a retired biologist from the University of Aachen, recalls her the never-ending disgruntlement between scientists and businessmen and questions whether the U.S. will remain among the leading research destinations in the world. Like many of the other professors, she calls on society to recognize the futuristic value of science and look beyond the current investments. “Donald Trump shutting down the impasse, shutting down climate research. It hits us all. There is only one Earth,” Susanne began impassionately. Unlike the other scientists, Ficus emphasized the democratic damage from not only the Trump administration’s scientific policies but also within the context of the travel ban. And, from an even more political standpoint, Ficus thinks this scientific denial will harm diplomatic relations between the U.S. and Germany. Asked whether a brash, anti-science candidate could emerge in Germany. She thinks not, citing that although many Germans dislike Merkel because she’s so unresponsive, they appreciate and trust her decisions because it will be considered methodically and unbiased.